2016 Marvel Masterpieces Base Set #1 thru 81 Complete. Cards are in NM condition. Includes #1-36 (Tier 1), #37-63 (Tier 2) and #64-91 (Tier 3) cards. Cards are always securely packaged for the trip to your home. Links to my "Pick One" Card auctions are listed below... Achievement singles (base, gold and what if). Autograph Base Silver Spectrum singles (1 thru 90). Autograph What If Silver Spectrum singles (1 thru 90). Base singles (1 thru 63). Base singles (64 thru 81). Battle Spectra singles (BS1 thru BS16). Buyback Silver Foil singles (1 thru 99). Canvas singles (91 thru 100). Gold singles (1 thru 63). Gold singles (64 thru 90). 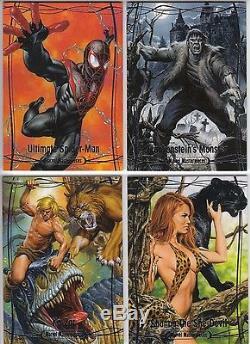 Holofoil singles (1 thru 17). Holofoil Speckle singles (1 thru 17). Orange Legendary Foil singles (1 thru 90). Purple Epic Foil singles (1 thru 90). What If singles (1 thru 63). What If singles (64 thru 81). 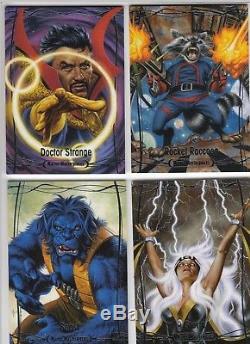 The item "2016 Marvel Masterpieces BASE set #1-81 Complete 81-Card (excl. Tier 4 #82-90)" is in sale since Monday, December 25, 2017. 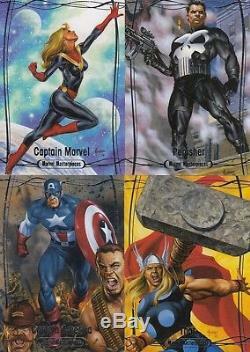 This item is in the category "Collectibles\Non-Sport Trading Cards\Trading Card Lots".hero" and is located in Medina, Ohio. This item can be shipped worldwide.